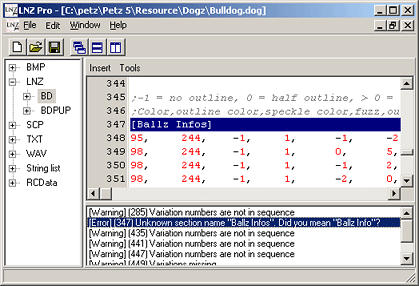 LNZ Pro is an all-purpose Petz, Babyz and Oddballz file editor. It can edit breeds, pets, babies, toys, playscenes and other Petz resources. It is a complete replacement for the tool "Resource Hacker", but misses out on the annoying Resource Hacker bugs that can corrupt your file! Please make backup copies of any files that you intend to edit. Convert your breeds to Unibreeds and have them work in all Petz versions! LNZ Pro makes creating non-overwriting breeds easy! Just click File->Save as, save your breed with your new name, and a wizard will guide you through the steps of creating a non-overwriting breed. LNZ Pro cannot edit pregnant pets from Petz 5. This version fixes a bug where breeds could be modified simply by viewing them with the "Browse folders" option. Version 3.4.1 could cause damaged breeds (Typically ones that have been hand-edited by a hex editor) to become unusable when using Browse Folders. This version fixes problems with resizing the "Messages/Help" window which could cause it to disappear. Ready to go? Head over to the download page.